Another great idea to help bolster our troops stationed overseas or in military hospitals throughout the world. Holidays are a tough time and bringing a smile to one face is worth it. For more information check out the Red Cross site for more. We are all gearing up for the holidays, but here is a item to put on your TO-DO list! I recently saw a post on FaceBook about “Thanking Our Heros”. I read the article and thought this is a fabulous idea to share with you. Please SHARE THIS on your network too! Please put this on your TO-DO list! I am going to get some cards for “Thanks”…..or seasonal for “Thanksgiving” and get them done. It’s such a small way to thank-you to our Heros in the Hospitals. This is a great way to say thank you to our soldiers. I personally plan to get to work on my holiday cards early this year, and this is a great way to get started on them early! 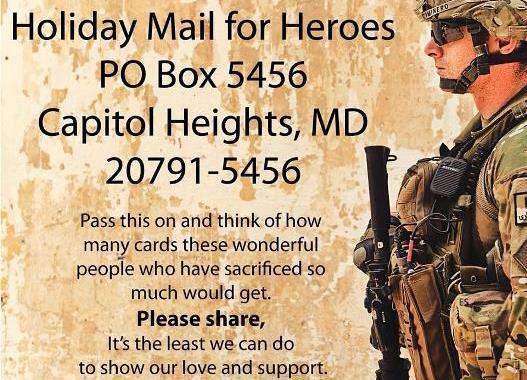 The deadline in December 6th, so please get your cards and in the mail before THANKSGIVING! This is a great way to tell our soldiers that we are THANKFUL for their service! Cards addressed to specific individuals can not be delivered through this program. If you are mailing a large quantity of cards, please bundle them and place them in large mailing envelopes or flat rate postal shipping boxes. Each card does not need its own envelope, as envelopes will be removed from all cards before distribution. Please share this idea with all of your friends too! Are you looking to buy a home in Gainesville FL area? Please Visit the Gainesville Real Estate Talk our site is full of information about beautiful Gainesville. Are you curious about your home value in Gainesville, Florida? Get a FREE Report with no strings attached. I welcome the opportunity to serve you in Gainesville Florida! 10 Reasons why I won't Sell your Home and I Don't Do Windows!!!! Veterans Administration in Undeclared War with Vets? How to heat water with a hair dryer.